Meet Emily Kearns, a CAPA Florence alumna who will be sharing her post-study abroad world with us in a monthly CAPA World column about how the city still influences her life today. Hello! I’m Emily and I am so excited to be writing again for CAPA World as a CAPA study abroad alumna. I studied abroad in Florence during the spring of 2015 and could not have asked for a more life-changing and amazing three and a half months. Through my travels, I learned more about the world as a whole, my peers, my passions, and most importantly — myself. 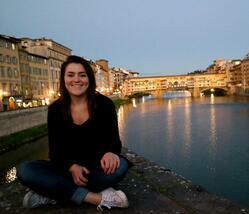 Each and every day I reminisce about my time in the beautiful city of Florence and I long to return there soon. I am currently in my last semester at the University of Pittsburgh, where I’m studying communication and business. Though I’m not completely sure what my future plans are (who really is, anyways? ), I do know that I would love to somehow incorporate my passions for writing, photography, and travel in my future career. Through this column, "Remembering Florence", I hope to share my memories, experiences, and post-study abroad knowledge with past, current, and future study abroad students. Since study abroad was the most impactful experience of my life thus far, I hope that my passion and love for the city of Florence, and study abroad in general, shine through the words that I write. Links for each post will be listed here so bookmark this page!